I’ve recently got back from a lovely holiday in a beautiful country I’ve not visited before, Slovenia. As usual with holidays, there is a temptation to bring back all sorts of themed tat, just because you want a souvenir of your trip, but as anyone who has bought a key ring/giant pencil/eraser/pencil sharpener/novelty hat etc can tell you, once you return home you wonder why you bought something as classy as a kiss-me-quick hat from Blackpool and where on earth you’ll put that straw donkey! But I still like to bring something home as a reminder of my trip, so I try to look for something that I like on it’s own merits, not just because it was the least worst item in the gift shop. I have a silver pendant that I bought in Italy which I wear almost every day, and although I’m fairly sure that I could have bought something similar elsewhere, I bought it because I liked it and every time I wear it it reminds me of my trip. Sometimes this approach means that there isn’t really anything that I want, but this time I found some really beautiful local crafts that I just had to share with you. We stayed in Bled, a town on the edge of the lake of the same name, surrounded by the Julian Alps. On our first day in Bled, I spotted a few covered stalls in a little tree covered space near the lake. Taking a closer look, I discovered it was a craft fair which took place every weekend. There were lots of beautiful crafts on display, all sold by those who had made them and I spent quite a while looking at each stall, trying to decide what I could fit in my suitcase! The top one in the picture is hand carved from plum wood and has the most incredible coppery colour when it catches the light because it is sanded so smooth that it almost gleams! The second pendant is handmade glass and is an amazing blue colour that I just can’t capture in a photograph. I will probably buy a silver chain to wear it on, as the cord it came with has findings (clasp etc) which my stupid skin tends to be allergic to, so I’ve not worn this yet, but I look forward to it! A couple of days after we arrived, we came across a jewellers which amongst other things had the most beautiful and finely detailed silver filigree that I have ever seen. 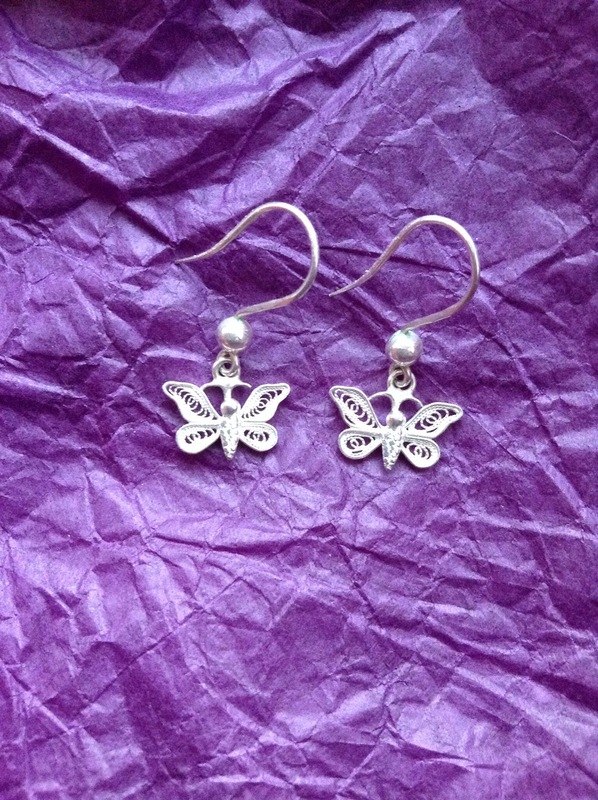 There were so many stunning delicate designs that it was hard to choose just one, but eventually after much deliberation I settled for these butterfly earrings. The earrings were handmade to a traditional design by the lady who owns the shop, who told us that filigree is a dying art in Slovenia and that she is the last of her family who can make it. They are tiny (about 1cm across) and so incredibly detailed that I cannot imagine how many hours they would take to make. I’ve worn these almost constantly since I bought them so I can already tell that they will be a favourite for years to come and a constant reminder of my visit. 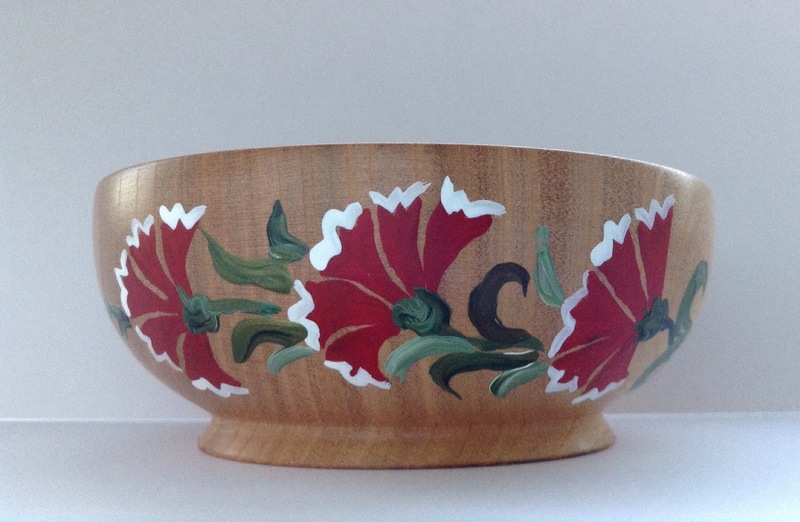 The flowers are carnations, the national flower of Slovenia and I love the simple style of painting against the smooth wood. Surprisingly I found this in a gift shop next to the church of Saint Martin in a part of Bled called Grad (which means castle), but on this occasion I was pleasantly surprised to find that the majority of the items in the shop were handmade locally, including knitted socks, silver jewellery and intricate bobbin lace. It seemed that crafts are more valued in Slovenia than in Britain, but whether this is because the economy in places like Bled is reliant on tourism is hard to say (the craft market, for example only runs in the summer when Bled is at it’s busiest). There were lots more interesting and inspiring things in Slovenia which I’ll show you another time! What’s the best (or worst) souvenir you’ve ever brought back from holiday? « Why do we blog? Stunning. I love the bowl, so very special. And who could say no to such beautiful jewelry goodies. What beautiful treasures you brought back! Each of those things expresses the spirit of the person who made it. 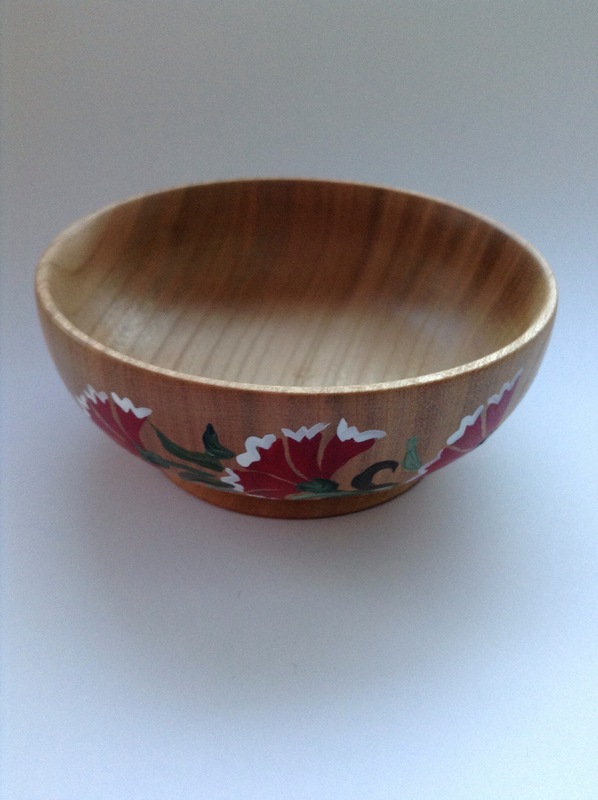 I particularly like the carnation design on the bowl. I think carnations are a very old and pervasive design element – I remember being surprised to see them on Tudor embroidery samples at the V&A. And am I right in thinking you also see them in Egyptian and/or Middle Eastern needlework? Anyhow, I’m so glad you had a good holiday. Thanks for sharing these things with us. It’s nice to buy handmade things from the person who made them. I think as crafters ourselves we appreciate handmade things more, perhaps particularly as knitters (not the speediest of crafts) as we appreciate the time that goes into them and, as you say, just how personal the items are. The carnations are interesting, but I have to admit to being completely ignorant of their wider place in art and needlework. It’s interesting that they crop up in so many different cultures, and certainly there are similarities between folk art from different European countries (most folk art motifs are symmetrical for example). It was a really interesting trip! Hi again, Lottie. Such a strange coincidence this morning. I went to a very relaxed church, where a woman (who was partially paralysed, perhaps with a kind of palsy?) embroidered a gorgeous piece throughout the service. She said it helped her to stay calm. She was incredibly adept as she only had full use of one hand. And what was she embroidering? Carnations! Glad you enjoyed it! 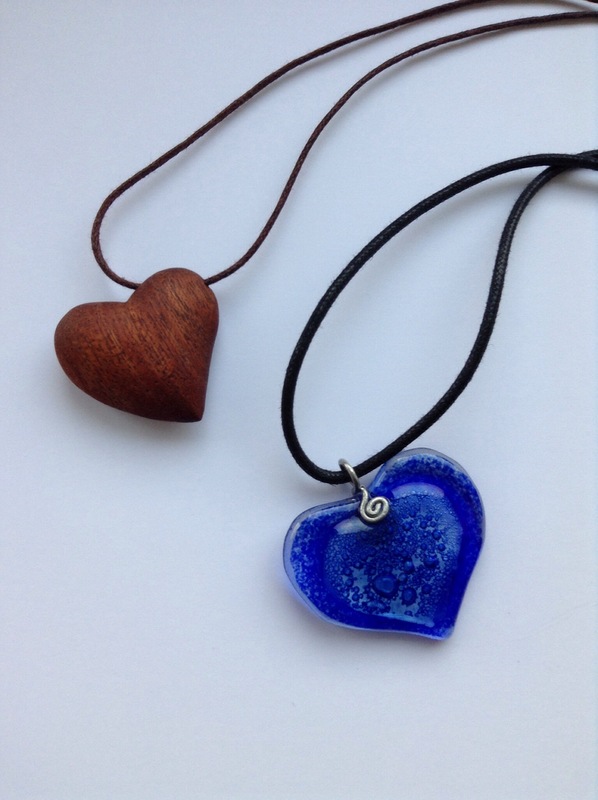 The plum wood heart pendant is really beautifully made, I could have picked a much more complex piece, but the amazing colour of the wood and the pleasing shape drew me to this one. It’s really nice to hold, which strange as it may seem is important to me in a pendant as when I’m stressed I tend to absent-mindedly fiddle about with necklaces like worry beads – weird I know, but it calms me down! The souvenirs you bought sound lovely. I’m sure your cardigan and watercolour will remind you of Ireland every time you look at them 😊 I did buy four fabulous folk art style prints as well from the artist who painted them, but while I would love to show them to you I want to protect his copyright (as far as I’m aware he doesn’t have a website) so I can’t really put them on the blog, but they are very inspiring!